Will Stormont deliver success or failure? 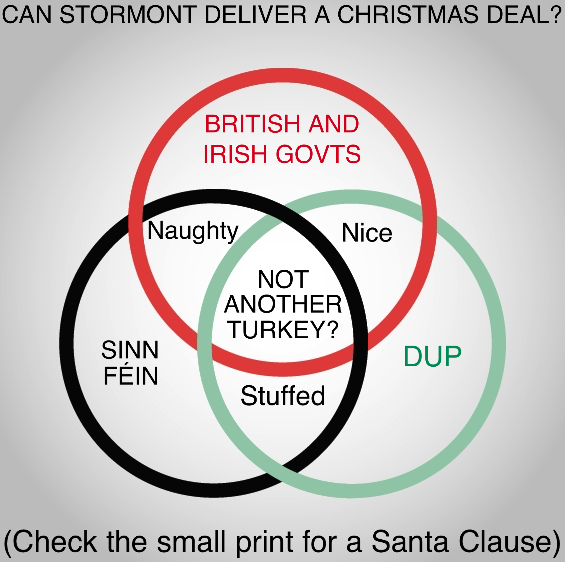 Can a Stormont deal be delivered? IT ISN’T Christmas Eve yet, but with David Cameron and Enda Kenny arriving in Stormont, what will their intervention deliver for the talks? The assumption is that their arrival suggests a deal of sorts must be on the way. And it is possible the governments will present a `heads of agreement’ that aims to corral all sides onto some common ground. But the final furlong of these two-month long negotiations has heavy terrain to cover if it is to produce a deal that can stand the test of time. The Detail recently reported here on the unprecedented collection of competing agendas around the negotiating table. Not only is it claimed that the DUP has a special relationship with the Conservative Party because of Westminster politics, but the government parties in Dublin are at war with Sinn Féin because of tensions in the Dáil. Seeing how all that mutual suspicion plays out over the next few days promises to make for interesting viewing. How will the parties square the circle? Sinn Féin’s position on welfare cuts is key to a deal. But the party wants to solve Stormont’s budget crisis, while also avoiding any damage to its position as a critic of austerity cuts in the Republic. If extra money has been found to do both, republicans have nevertheless still committed themselves to achieving a wider deal that tackles other challenges facing the peace process. But how will the DUP accept a deal that strays beyond a financial package? Peter Robinson is already fighting a rearguard action over loyal order parades. Will his party want to go into May’s General Election with an agreement covering sensitive issues such as dealing with the legacy of the Troubles, which may provide ammunition for its opponents? If a fiscal package can be found to shore up the crumbling Stormont budget with new money and access to investment, what then of the deeper issues related to the peace process? The Detail reported here, how the British and the Irish governments have their own reasons for potentially wanting to put the past on a long finger. David Cameron and Enda Kenny are not arriving as mere observers on the issue. Amnesty International and a range of other campaign groups marked Human Rights Day by issuing a statement on the talks that set out their position on dealing with the legacy of the Troubles. The human rights groups cited the failure to implement either the Eames/Bradley blueprint of 2009 or the Haass/O’Sullivan proposals of last year. The groups said: “It is our view that all too often for the sake of political expediency, meaningful discussion of the past or legacy gets put on a back-burner in order for other deals to be brokered. And yet, those other deals, typically, tend to fall apart because of the underlying failure to address the past and the divisions that continue to exist as a result. “Addressing the past and getting it right is important not just for victims’ right to truth and remedy, but is crucially important to the wider aspirations of societal reconciliation, healing and recovery. This comes after a leaked Stormont policy discussion paper has raised concerns among victims of the Troubles that there may be an overhaul of how their needs are met. Victims, survivors and human rights groups may be nervous that a Stormont deal could fall short of the standard they believe is necessary.